The tips, techniques, and information presented here give students, travelers, and businesspeople a primer on how to speak Italian. 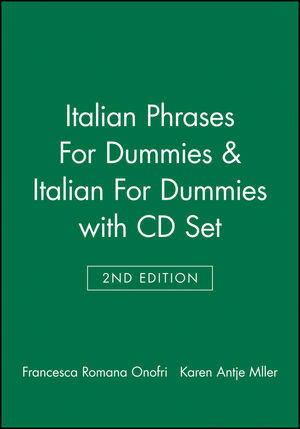 Complete with updates, a bonus CD, and the traditional For Dummies user-friendly format, this new edition of Italian For Dummies gives you reliable lessons, practice, and language learning techniques for speaking Italian with ease and confidence. 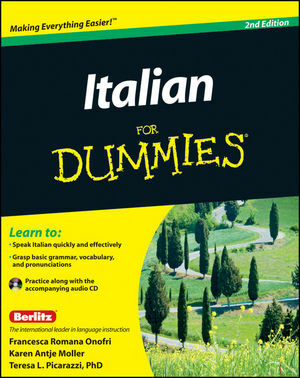 Featuring a revamped, user-friendly organization that builds on your knowledge and ability, Italian For Dummies offers expanded coverage of the necessary grammar, major verb tenses, and conjugations that beginners need to know. Plus, you'll get a fully updated and expanded audio CD that includes real-life conversations; a refreshed and expanded mini-dictionary; more useful exercises and practice opportunities; and more. If you're looking to reach a comfort level in conversational Italian, Italian For Dummies gets you comfortably speaking this Romantic language like a native. Berlitz has taught languages to millions of people for more than 130 years. Francesca Romana Onofri and Karen Antje Moller are veteran language teachers. Teresa L. Picarazzi, PhD, teaches Italian at The Hopkins School and has lived and worked in Cortona, Florence, Ravenna, Siena, and Urbino.